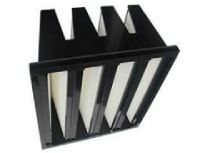 V-bank air filter can be used as final air filter in cleaning filtration system. It is applicable to air separation, purification of dust, In order to ensure cleanliness requirements system, extending use life. Frame: High Quality Standard Size Plastic Frame, galvanized sheet. 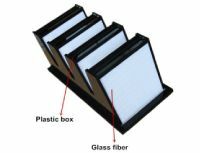 Filter material: Polypropylene filter paper, glass fiber filter paper. Premium polyester fiber or ultra-fine fiberglass paper. Polypropylene plastic frame, nontoxic gas pollution when burned. Large filtering area, low resistance and long service life. For the large air volume Purification equipment. Used for air conditioning units of the terminal filtration.